Plants in your home are wonderful and there are ways to keep them beautiful. This guide contains houseplant tips and tricks. The plastic pie liners that come on top of graham cracker pie crusts are wonderful to put under your potted plants as drip pans. 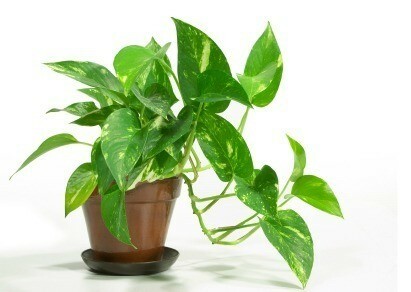 They are sturdy enough to keep the drips from getting on the table or wherever the potted plant is. Don't ever put your potted plants directly on the floor. Eventually, water begins to collect under the drip pan and damage the floor. If you don't have wooden or metal stands to sit them on, take two bricks and cover them with denim then put them under the plant. The air circulates and dries out the water. I've tried slabs of wood, but the brick seems to be best. I use the legs of old jeans to wrap them in. Put your potted plants on your old cookie or baking sheets with rims around them to catch any water that might leak from your potted plants. How do you tent a houseplant? There are several ways to tent a houseplant, the best ways include a supportive frame (bamboo skewers, coat hangers, etc) so that the tenting doesn't touch the foliage of the plant. Also important is to monitor the heat being generated by the tenting to make sure the plant is not over-heated. Do a Google image search to see pics, that's the easiest way to figure out the best method for your particular plant and environment. Plastic bags work well; but do check on heating, so as not to harm the plants. Your library will have books for this or use the search engines on your computer-Google, Yahoo, etc. to look this up. Good Luck.